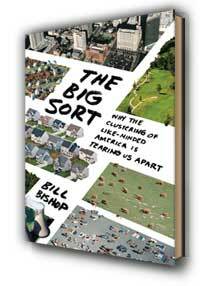 Bill Bishop, a Texas journalist and the author of “The Big Sort: Why the Clustering of Like-Minded America Is Tearing Us Apart” (Houghton Mifflin, 2008), argues that this tribalism is a major driver of the country’s deepening political polarization. Over the last 30 years, he says, greater mobility, laws enforcing racial equity and prosperity have given Americans even more choice about where to live. Will Internet-enhanced abilities to scout out communities intensify that sorting effect?